My food-pushing Aunty Tee introduced me to these cookies waaaaay back in 1997, when we were living in Oregon. I have a hard copy of the original email where Aunty Tee sent me the recipe. 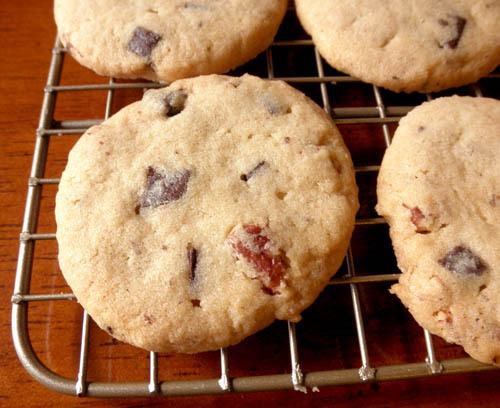 She had mailed us some delicious cookies for Christmas, and these Chocolate Chip Shortbread Cookies were in the mix. By the time they got to us, they still tasted fresh, and were slightly crumbly around the edges, and the resulting crumbs created a sand-like coating around the rest of the cookie. Their flavor reminds me of Pillsbury Sugar Cookies made from the dough in the tubes, but not when you only partially bake them. They're crisp, like when you slice the tube o' dough quite thin and bake thoroughly. Mmmmm...another happy flavor from my childhood. The recipe only calls for a half cup of chocolate chips and a half cup of nuts. That might not sound like enough, but the star of these cookies is the shortbread, not the chocolate or nuts. 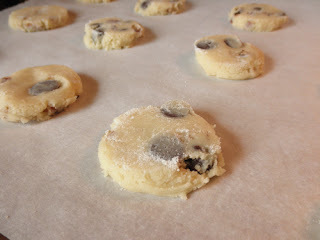 If you're looking for a chocolate chip cookie that won't go stale after a day, I recommend these, or the Crisp Mini Chocolate Chip Cookies on this blog. · Preheat oven to 325°F. · Cream butter and sugar. · Add vanilla and egg. · Sift dry ingredients together and add to mixture. · Stir in nuts and chocolate chips or Dove Dark Chocolate chunks. · Drop tablespoon sized balls onto parchment-lined baking sheet (I used a cookie scoop), and press to flatten with a cookie stamp or bottom of glass dipped in flour or sugar. · Bake at 325°F for approximately 18 minutes. · Remove to wire rack to cool. Then store in an airtight container. dee-lish! the pictures turned out great!